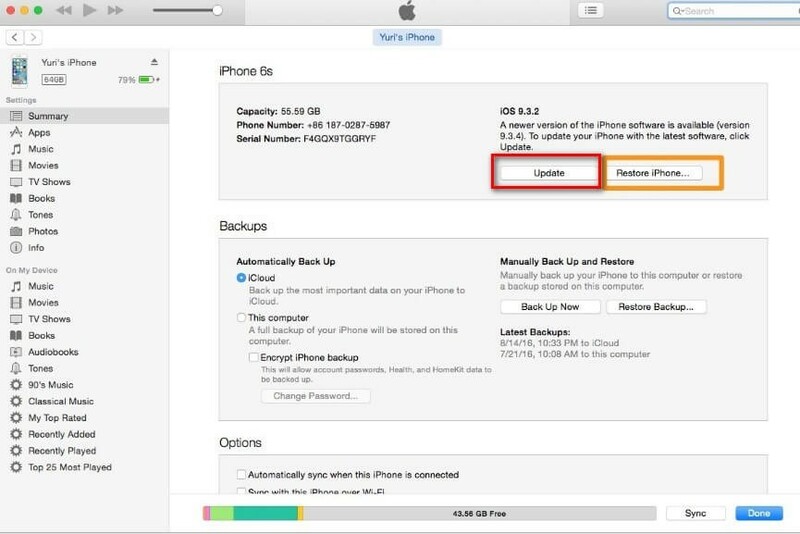 A quick and easy fix for the iPhone/iTunes error 9006. Get iSkysoft Toolbox – Repair (iOS) now and never experience iPhone errors again. Sometimes popular iPhone processes can backfire on you and give you a real scare. If you don’t believe it, then look at some of the issues that people raise on Apple forums. One of these is the iTunes error 9006, which sometimes shows as err = 9006. This error comes about when you are downloading or updating your iPhone using iTunes. Thankfully, iSkysoft Toolbox – Repair (iOS) can easily help you deal with this error. However, it is equally prudent that you get to know about other methods that you can use to resolve the iOS error 9006 iPhone or iPad challenge. There are times when any Firewall or Security software may block incoming downloads and updates. Rather than trying to figure out which downloads and updates to ignore, it is better to simply turn off the security software until you complete the update or download that you are doing. Simply access the settings of your security software, and then turn it off temporarily. Then connect your device to your computer before retrying the download or update that you were doing. With the security software turned off, iTunes will proceed without bringing up the iPad error 9006 notification. It is very common for iTunes to bring up various errors due to a bad internet connection. At other times, it may just be an issue with the internet protocols of the network that you are using. You may be able to do away with the iTunes error 9006 problem by simply changing to another network. If working from home, perhaps you could go to an Internet café and then try out their Wi-Fi connection. If your network was the issue, the error that you got will not come up again. iTunes can really be sensitive at times. You could have been using the same computer for ages without having any issues on iTunes, but then one day you get an iPad error code 9006 notification, and suddenly iTunes no longer wants to connect using that computer. The answer in this case is simply go to another computer and log into your iTunes account again, connect your iPhone to the new computer and try the update or download again. Simply changing computers can work magic when it comes to removing the iPhone error code 9006 issue. If you are adept at tinkering around the settings of your computer, you might want to check see if your network settings are the issue. 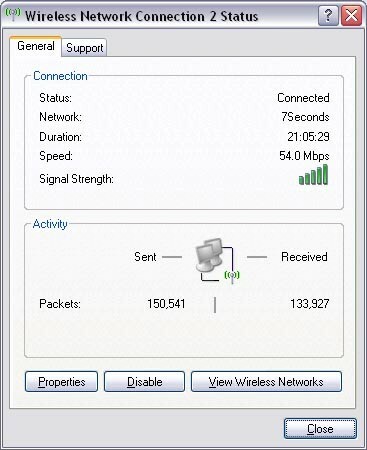 Access the troubleshooter and let it check out how your network is operating. Based on the results brought about by the troubleshooter, you can rectify any network issues that may be interfering with your connectivity to iTunes. NOTE: If you are not sure about changes that may be made to the network settings, then you should consult with an expert before making drastic changes. You may also be experiencing an iTunes error 9006 simple because you are using an outdated version of iTunes on your computer. The iPhone may also not be compatible with the iTunes version that you are using. It is advisable that you update to the latest iTunes version in order to resolve this problem. Start off by going into iTunes. If there is an updated version of iTunes available, you will be notified, then you can simply agree and follow the on-screen prompts to get the latest version of iTunes. When the update is complete, connect your iPhone to your computer and then proceed with the download or update that you were working on before. 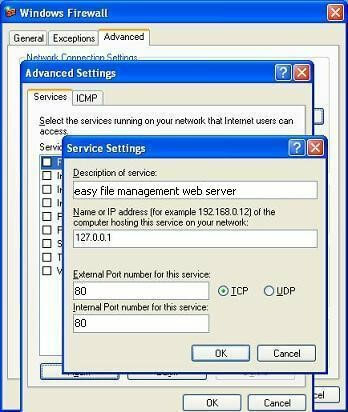 Port 443 and Port 80 are the ones used to access websites by any computer or router. You can check if they are open simply using your web browser. 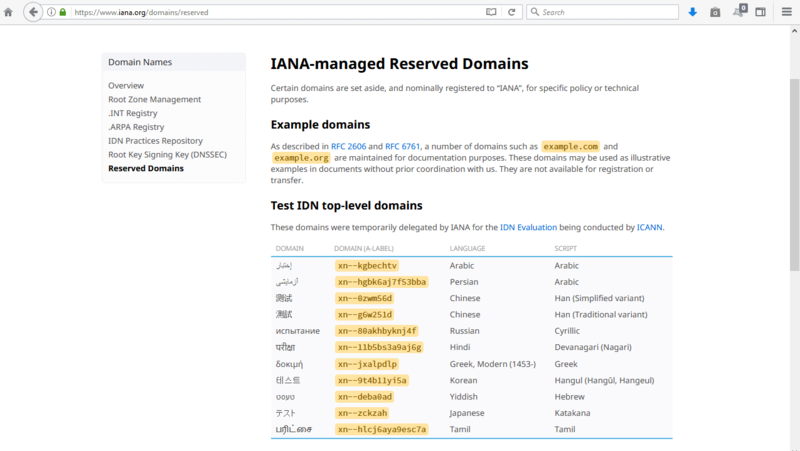 In order to test if they are open, you need to open the domain name for the HTTPS protocol. If there is something that is using any of these ports, then the process will fail and you will know that they are not open, and that is why you are getting an error code 9006 on iTunes. You may also check if the ports are open using the “localhost” feature. This allows your computer to access the ports even if it is offline. The firewall or internet security settings may be interfering with the connection to iTunes. 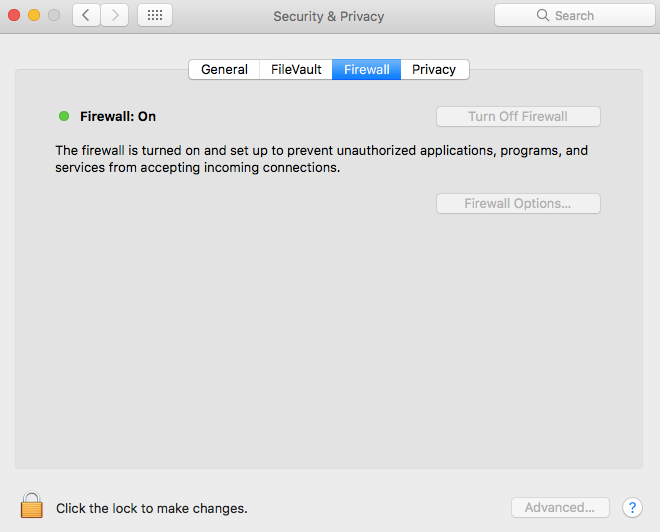 At times the firewall will refuse to recognize the device and therefore stop it from communicating with iTunes on your computer. Access “System Preferences” from the Apple menu. Click on “Security & Privacy”. Unlock the firewall pane by clicking on the lock found in the lower left corner, enter the admin username and password and then disable the firewall. Go to the notifications area on the lower right corner. 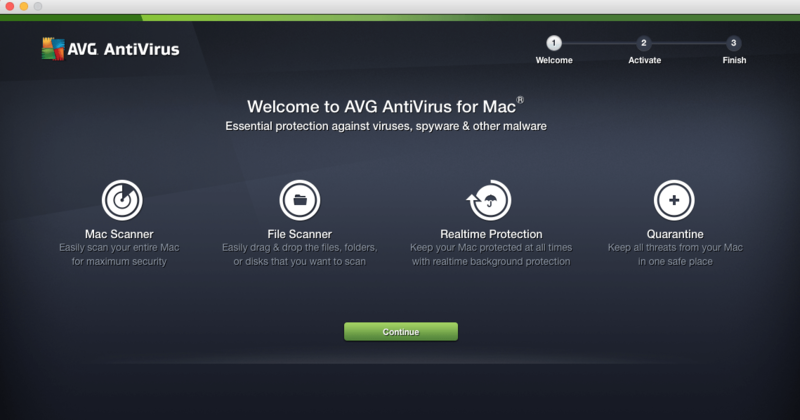 Look for the firewall or antivirus icon. 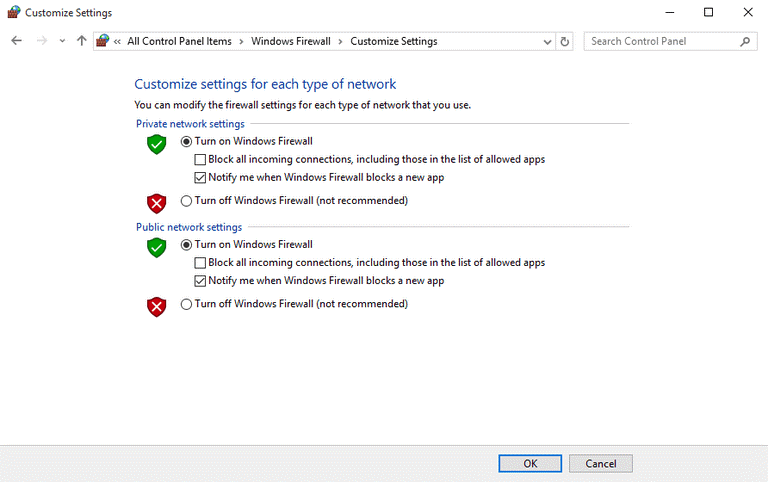 Disable the firewall or antivirus by right clicking it and selecting “Disable”. The time has come for you to update your iTunes, download some fabulous software or restore your iPhone using iTunes. All seems to be going well, and you are looking forward to having a revamped devoice for your use. The screen flashes, “There was a problem downloading software for the iPhone. An unknown error occurred (9006)” or something even scarier, “err = 9006”. Thoughts of losing your precious iPhone flash through your mind. Well, you can now relax and take a breather, thanks to iSkysoft Toolbox – Repair (iOS). This magnificent application has been carefully designed to sort a wide range of issues that commonly affect iPhones and iPads. The following steps will show you how to easily solve the iTunes error code 9006 issue. Ease of use – The intuitive interface of this tool makes it very easy to use. You simply access the home page and select the features that you want to use. They are clearly labeled and when you start using them, the prompts are also easy to follow. Simply connect your iPhone, start iSkysoft Toolbox, enter iOS repair, and with a few clicks of the mouse, the iTunes err 9006 problem will be resolved. Full iOS compatibility – It does not matter what iPhone version you are using, iSkysoft Toolbox – Repair (iOS) will work with all iOS devices to solve the error code 9006 on iTunes. This is a handy tool that will resolve any problem that may afflict your iPhone or iPad. No data loss – The nightmare for all Smartphone owners is the loss of data, such as contacts, videos, images and more. With this application, the iTunes download error 9006 will be fixed without losing any data on your device. Visit the iSkysoft Toolbox official download site, and download the application and install it on your computer. After installing it, launch it and enter the home screen, and click on the “Repair” feature. After clicking on the “repair” module, you will get a popup window listing various issues that affect iOS devices. You do not need to select any option. Simplyclick on “Start” and iSkysoft Toolbox – Repair (iOS) will go ahead and crack the iOS error 9006 issue. 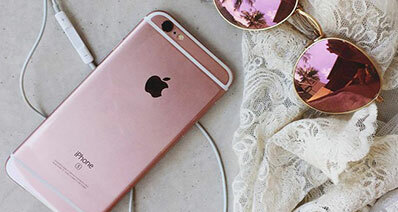 When the connection between your computer and iPhone is successful, you will be able to see the details of your device. Go ahead and click on “Next” to proceed. Sometimes, your iPhone will not be recognized, indicating a much deeper issue. At this point, iSkysoft Toolbox – Repair (iOS) will ask you to reboot into DFU mode. That sounds tricky right? Well here is how you go about getting into DFU mode. Then press and hold the “Power” and “Volume Down” buttons at the same time. Keep the “Volume Down” button pressed and let go of the “Power” button. Switch off your iPhone and then connect it to your computer. Quickly start off by pressing and releasing the “Volume Up” button followed by the “Volume Down” button. 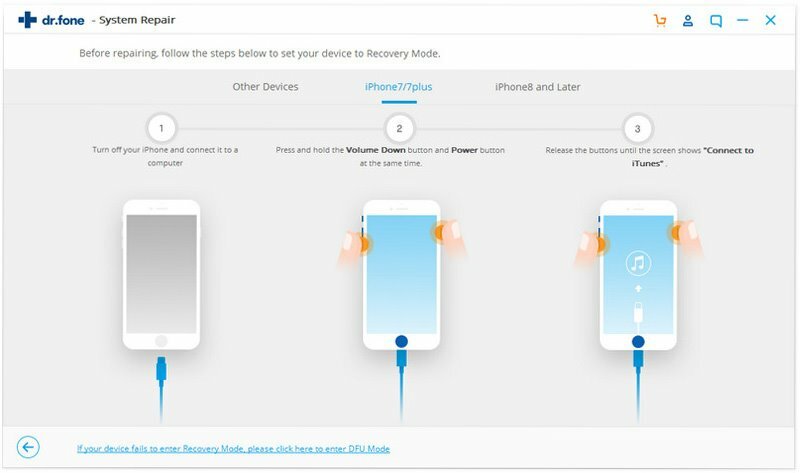 Follow up by pressing the button on the side and wit to enter Recovery Mode. Connect the iPhone to your computer and then press the “Start” button. Press and hold the “Home” and “Power” buttons at the same time. Release the “Power” button while keeping the “Home” button pressed. When you enter DFU mode, your iPhone, iPad or iPod will be recognized. Proceed and confirm that requisite options before downloading the firmware to your device. If you are not sure about your device model, simply click on the green link found under the “Download” button and iSkysoft Toolbox – Repair (iOS) will do the rest. 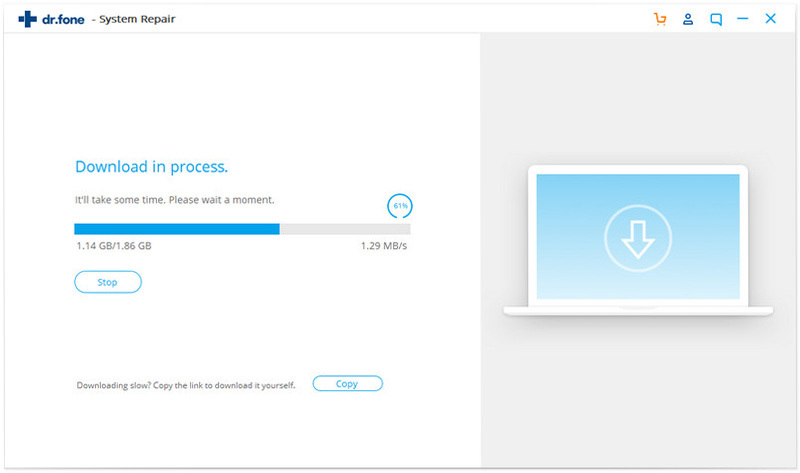 After filling out the checkup, proceed and click on the “Download” button, and then patiently wait for the download to be complete. You might want to catch up on a movie as the large file may take some time to download. If you had ever downloaded the firmware in the past, you can simply click on “Select” and the browse for the file, and import it to your device. With the firmware downloaded to your device, you may now go ahead and resolve the iTunes error 9006 problem. You must make sure that the “Retain Native Data” box is checked so you do not lose any data on your device. And now for the final victorious step, click on the “Fix Now” button. And just as simply as that, the error code 9006 on iTunes will be fixed. You may now go ahead and complete the update or download that you were doing in the first place. Step 1 - Go to the official IPSW page, and then download the correct file for your particular iPhone model. Then go to iTunes and visit the “Summary” section. Here you will find the “Restore” and “Update” buttons. When using a Mac: Hold the “Option” and “Command” keys and then click on the “Restore” or “Update” button. When using Windows: Press the “Shift” key and simultaneously hit the “Restore” or “Update” button. Step 2 - Once you have downloaded the correct IPSW file, select and launch it on your computer. The IPSW file will then allow iTunes to proceed with the update or download without bringing up the iTunes error code 9006. No need to worry now if you are also facing the iPhone error 4000, this article below provides you with some easy fixes to get rid of iPhone/iPad error 4000.